Rural accommodation located in Sant Pau d'Ordal. 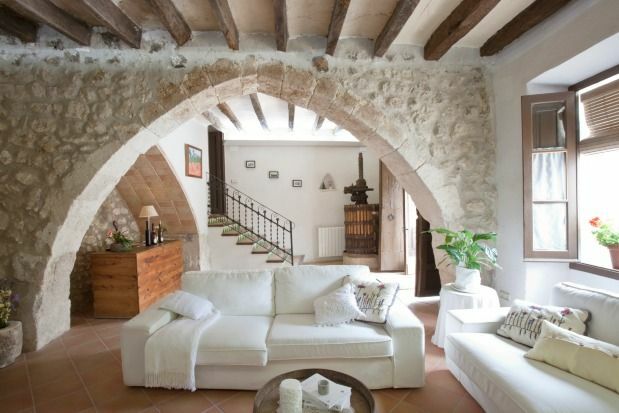 House of the late twelfth century, is a unique accommodation with stone walls and wall, which retains three arches and one of arches. With a capacity of 21 people, it has a ground fire inside. Can Masana de la plaça is located in Sant Pau de Ordal, just in front of the town church, in the old quarter. The majority of the inhabitants of Sant Pau conrrean the vineyard, since the town is in the middle of the Penedès, land of wines and caves. 50 m from the house is the forest, surrounded by vineyards. It is recommended a walk through these places, a bicycle tour, and if we are in the months of September, you can see the collection of the grape. - Can Masana has wi-fi internet access throughout the house, ideal for commercial, who need to communicate with your company; company meetings, to consult data via internet with the laptop and for foreign tourists, to consult news from your country or communicate via e-mail - Can Masana has a large main room with two half-pointed arches where you can see an old bread oven. It is necessary to remember that the house is from the end of the s. XIII. - In this room we will find the earth fire, the kitchen, the ambient music equipment, the TV and a magnificent window that will take us to the inner courtyard. - A curious observation is that the highest part of the arcade is obscured, because, centuries ago, when passing with the torches the stone burned. - The interior patio is the most beautiful and quiet space in the house. In this one there is the garden, a historically very important arch, music, etc. It is ideal for outdoor meals as it is quite large. - The rooms are located on the top floor of the house, except one that is on the ground floor. All the rooms are decorated to the smallest detail, all the furniture of the house are old and have been restored. The house has 6 double rooms. It was my birthday weekend and my friends and family came from as far away as US. We had a wonderful time, the atmosphere of the house was wonderful, especially the log fire. It was the little things that impressed us the most, there was wine, olive oil, salt, herbs, washing up liquid etc, etc provided. All the things that you need but don´t want to go out and buy for just a weekend. Also Montse provided a calçotada for us, it was brilliant and well worth the money. Thank you for giving us such a wonderful weekend. El pueblo muy tranquilo y con la ventaja de que la casa está en el centro del pueblo pero a la vez a pocos metros del bosque. Su dueña (la señora Montse) siempre dispuesta a ayudar para hacer la estancia todavía más agradable. Hemos disfrutado tanto que no tenemos ninguna duda de que repetiremos. Nos hemos reunido toda la familia en Can Masana durante un largo fin de semana, alquilando la Masia en su totalidad. El lugar es espectacular, llena de detalles, rincones testimonio de la historia del lugar. Los espacios son amplios, la casa bien equipada. Los patios exteriores muy agradables! la casa esta a dos pasos del centro del pueblo. La dueña, Montse, es encantadora, dispuesta a facilitar todas las peticiones de sus huespedes. Seguro que volveremos! La casa no le falta detalle, nosotros realizamos el alquiler completo y todo fue genial, Montse, la dueña de la casa es muy agradable y todo son facilidades, El espacio exterior de la casa es muy acogedor. Muy recomendable para grupos grandes. La casa es bonita y el entorno también (viñedos). El trato con la dueña estuvo bien. No había muchos platos, cubiertos, etc (los justos), por lo que teníamos que estar lavando cosas continuamente. Además al llegar todos los utensilios de cocina, platos, etc, no estaban muy limpios. Hemos estado tres días 22 personas, cuesta nucho encontrar una casa tan grande, pero Cal Masana nos ha permitido disfrutar en família. Son tres casas preciosas conectadas por un jardín. Tiene todo lo necesario para pasar unos días agradables. La propietaria, Montse, es una mujer encantadora siempre dispuesta a ayudar en lo que haga falta.